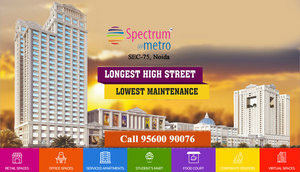 Spectrum Metro at sector 75 Noida is a commercial extravaganza spread across 6 acres of land with 1 km long frontage is definitely the most promising business proposition of recent times. This commercial project is surrounded by a population of approximately 8 lakhs. Spectrum Metro location is an asset to the prospective owners as the project’s connectivity to Expressway, NH-24 and Delhi makes it a viable business proposition for people looking to buy commercial space here. With price range starting from Rs. 24 lacs, the office spaces, retail shops, service apartments, medifloor are available in multiple size options from 305 sq. ft. to 1550 sq. ft. Every unit is equipped with state-of-the-art amenities and technologies making this project a highly productive one. The recreational needs of spectrum metro noida are fulfilled by 10 mega screens in partnership with INOX, a food court, multi-cuisine dining options and the kids gaming zone completes the family’s entertainment needs with placement of 100+ international brands around.